Preserving open space within our community is alive and well! What began with Frolic’s (George A. Weymouth) extraordinary efforts to save the King Ranch lands in 1984 continues. His success in preserving the over 5,000 acres was just the beginning. Now, over 30 years later there are 25,000 contiguous acres under easement within the Western Headwaters Area of the Brandywine Creek Watershed! That’s the good news, but the GREAT news is there are new initiatives happening to preserve open space. 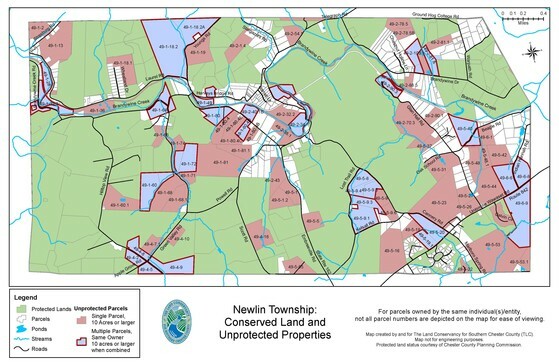 In 2016, Newlin Township passed an Open Space Referendum and established an Open Space Fund to assist residents in obtaining conservation easements for their properties. The fund will be generated by a property tax. In 2017, West Bradford Township followed suit and passed their Open Space Referendum utilizing the earned income tax. It is so very apparent that preserving our natural resources is still a priority to the people who reside in our area. In the 5 County Southeastern Pennsylvania area, there are approximately 240,000 acres of protected open space: federal, state, local parks, farmland and privately held. Of that, more than half is located in Chester County. 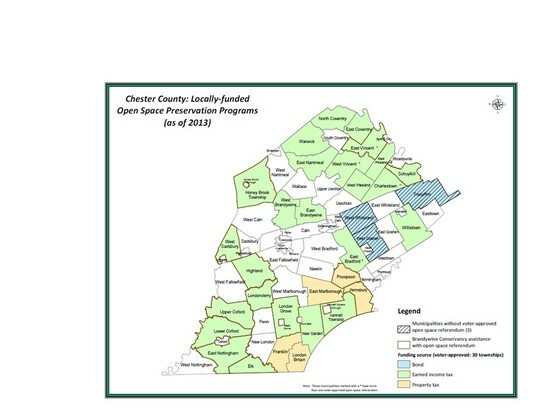 Which is not surprising given our County’s robust Open Space Programs and that of the 78 Townships and Boroughs within Chester County, 35 have dedicated open space funding in place. The municipal land preservation committees that are usually part of these open space referendums are a key ingredient to this success; they are the ambassadors and the conduits between the landowners and the land preservation programs. The Newlin Township Open Space Committee’s main purpose is to assess the preservation opportunities based on location, acreage, vulnerability, natural features, historical aspects and contiguity to existing preserved land and make recommendations to Township Supervisors with regard to the expenditure of open space funds. Another vital role is to educate township residents and property owners about the value of preserving open space and the opportunities that are available. To that end, we held our first ‘Conversations on Conservation’ forum at the Lenfest Center in the Cheslen Preserve on January 10, 2018. The panel included John Goodall, Brandywine Conservancy; Gwen Lacy, The Land Conservancy for Southern Chester County; Geoff Shellington, County of Chester Open Space Preservation and Jack Stefferud, Natural Lands. The event was well attended with residents representing over 450 acres. One of the evening’s highlights; a woman had brought her son to the event and stated “I’m not here for me, I’m here for him.” And so it goes… Time passes, we sit back on our ‘Laurels’ and congratulate ourselves about where we live. Lest we forget Frolic, Mrs. Hannum and the countless others who stepped up to the plate a generation ago to make a difference, we must remember that we all play such an essential role in maintaining and preserving the fabric of our exceptional community. Once open space is gone, it is gone forever.